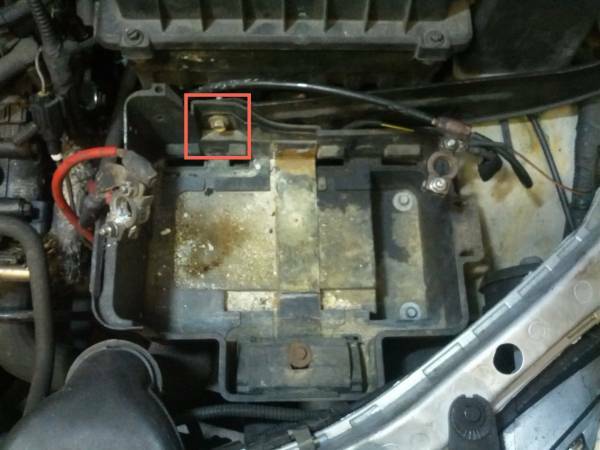 This guide is about replacing a leaky thermostat housing on my 2002 Ford Focus ZX3 with a 2.0L engine, so it should apply to the various models using that engine (ZX5, ZX3, ZTW, ZTS, SE, LX and S2). I just happened to get a kit that includes the thermostat and outlet component at the same time. 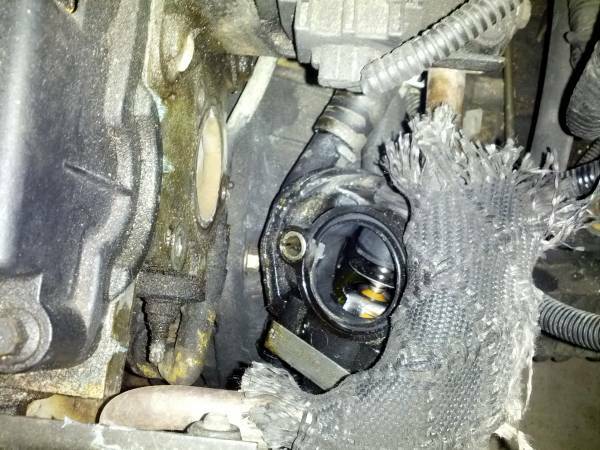 From my own experience and others I've read its quite common for the plastic thermostat housing to crack or break. Please note I'm not a repair technician or a "car guy" at all. I'm just a guy on a budget who is driving my Focus till the wheels fall off, at which time I will write a guide on that. Remove 4 screw holding on the lid of the Air Filter Chamber (or 3 screws in my case). Push up on snaps to release the Air Filter Chamber. 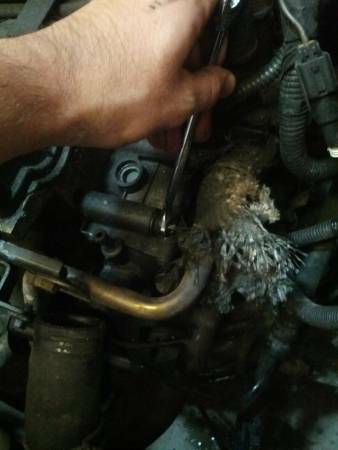 Now you can easily remove the air intake hose. If you have a leak you can likely skip this step as you will have very little to drain. 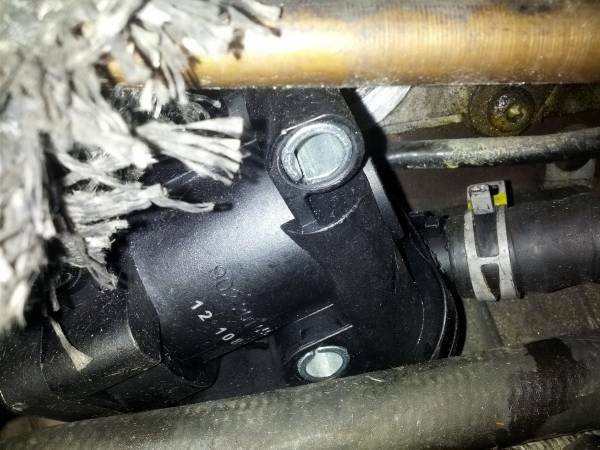 If you suspect you still have coolant or water in your system you should place a drain pan beneath the Thermostat Housing to catch any coolant or water. You may also find a drain kit at your local auto parts store. 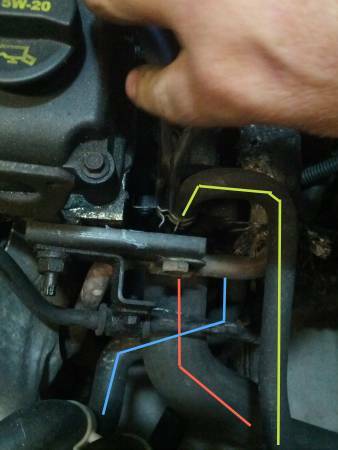 Remove the top hose (green) first. Remove the the two lower houses (Red & Blue). The hose clamp holding the hose may be difficult to release. If you have a clamp release tool this would be a good time to use it. Otherwise you can use pliers to remove it. A flathead screwdriver may help release them as well. There are three bolts to remove to release the Thermostat Housing. 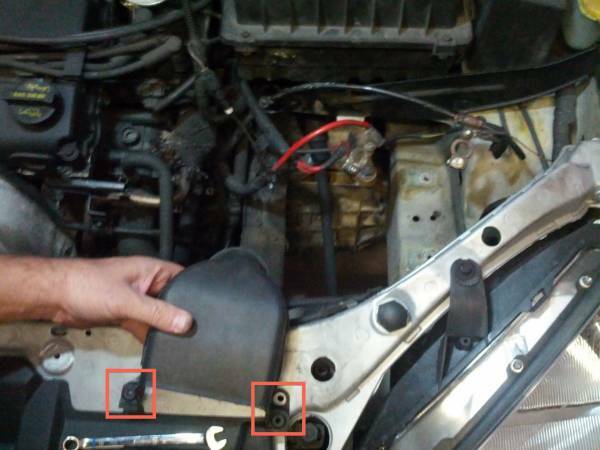 Use a 10mm wrench to remove the top forward bolt (closest to you). To Remove the top back bolt and bottom bolt you can use a 10mm deep socket driver. 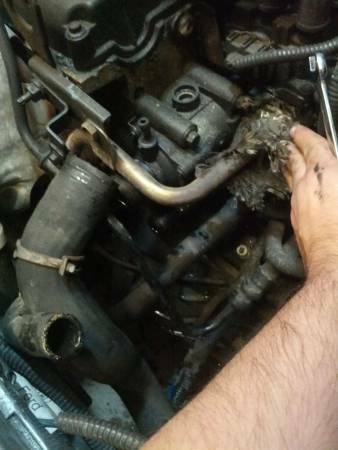 Remove the final hose at the rear of the the thermostat housing. Again these clips are pretty tough to remove so don't worry its normal. Attach the rear hose we removed. 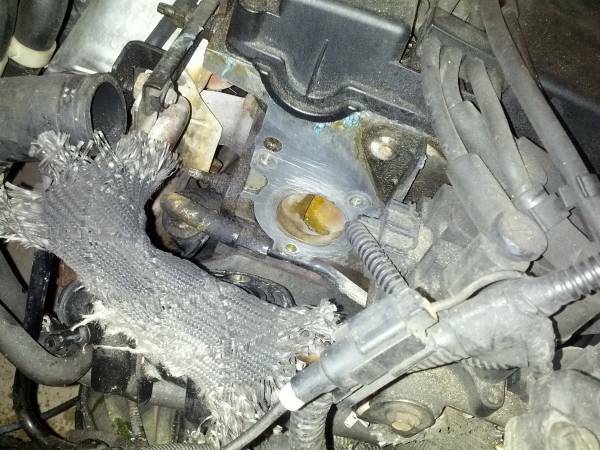 You'll want to do this before you reattach the Thermostat Housing back to the engine block. 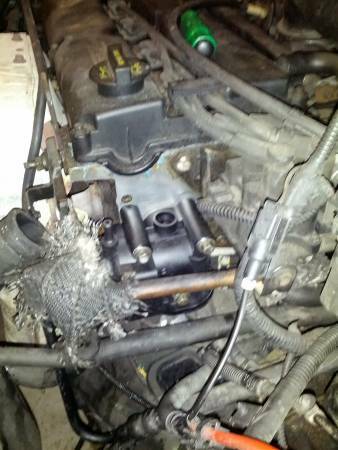 The rear hose is pretty impossible to get to if the Thermostat Housing is installed. Align the holes and insert bolts. Hand tighten each bolt. Be sure to tighten evenly. Tighten the bolts the rest of the way with the 10mm deep socket for the back bolt and the bottom bolt. You will need to use the 10mm wrench to tighten front bolt as it is too close to the metal line to fit the socket wrench. 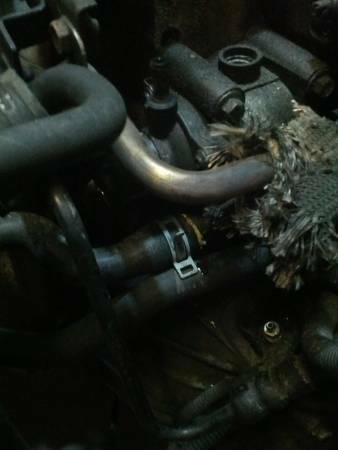 Reattach the two front hoses and top hose. 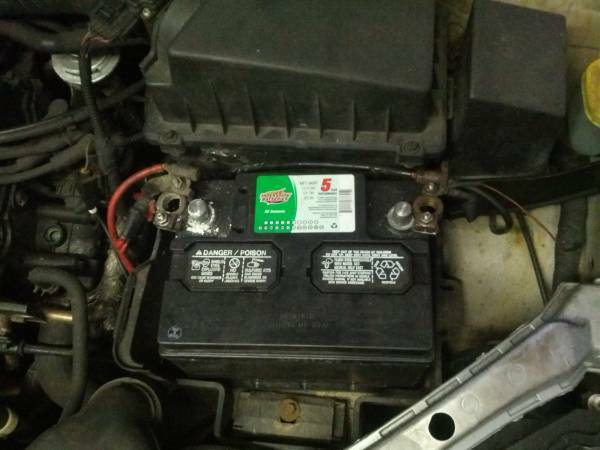 Install battery tray and battery. You're Done! That wasn't so hard. Now you can brag to your friends how much money you saved.